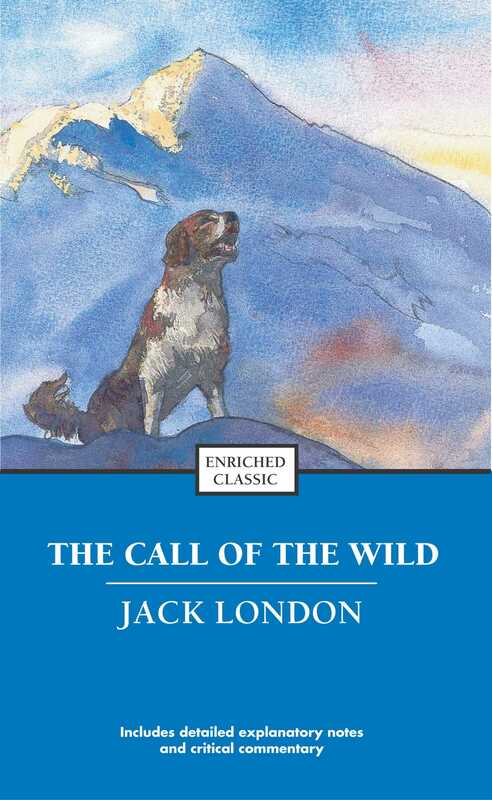 The Call of the Wild tells the story of the magnificent dog, Buck, who’s loyalty is tested by cruel men in search of gold in the Klondike. Brutally treated, Buck finds the blood of his wolf ancestors rising within him and breaks free to roam the Alaskan wilderness as leader of a pack instead of as a pawn in his owner’s ruthless mission. And over this great demesne Buck ruled. Here he was born, and here he had lived the four years of his life. It was true, there were other dogs. There could not but be other dogs on so vast a place, but they did not count. They came and went, resided in the populous kennels, or lived obscurely in the recesses of the house after the fashion of Toots, the Japanese pug, or Ysabel, the Mexican hairless -- strange creatures that rarely put nose out of doors or set foot to ground. On the other hand, there were the fox terriers, a score of them at least, who yelped fearful promises at Toots and Ysabel looking out of the windows at them and protected by a legion of housemaids armed with brooms and mops. But Buck was neither house-dog nor kennel dog. The whole realm was his. He plunged into the swimming tank or went hunting with the Judge's sons; he escorted Mollie and Alice, the Judge's daughters, on long twilight or early morning rambles; on wintry nights he lay at the Judge's feet before the roaring library fire; he carried the Judge's grandsons on his back, or rolled them in the grass, and guarded their footsteps through wild adventures down to the fountain in the stable yard, and even beyond, where the paddocks were, and the berry patches. Among the terriers he stalked imperiously, and Toots and Ysabel he utterly ignored, for he was king -- king over all creeping, crawling, flying things of Judge Miller's place, humans included. His father, Elmo, a huge St. Bernard, had been the Judge's inseparable companion, and Buck bid fair to follow in the way of his father. He was not so large -- he weighed only one hundred and forty pounds -- for his mother, Shep, had been a Scotch shepherd dog. Nevertheless, one hundred and forty pounds, to which was added the dignity that comes of good living and universal respect, enabled him to carry himself in right royal fashion. During the four years since his puppyhood he had lived the life of a sated aristocrat; he had a fine pride in himself, was ever a trifle egotistical, as country gentlemen sometimes become because of their insular situation. But he had saved himself by not becoming a mere pampered house-dog. Hunting and kindred outdoor delights had kept down the fat and hardened his muscles; and to him, as to the cold-tubbing races, the love of water had been a tonic and a health preserver. And this was the manner of dog Buck was in the fall of 1897, when the Klondike strike dragged men from all the world into the frozen North. But Buck did not read the newspapers, and he did not know that Manuel, one of the gardener's helpers, was an undesirable acquaintance. Manuel had one besetting sin. He loved to play Chinese lottery. Also, in his gambling, he had one besetting weakness -- faith in a system; and this made his damnation certain. For to play a system requires money, while the wages of a gardener's helper do not lap over the needs of a wife and numerous progeny. The kidnapper undid the bloody wrappings and looked at his lacerated hand. "If I don't get the hydrophoby -- "
"It'll be because you was born to hang," laughed the saloon-keeper. "Here lend me a hand before you pull your freight," he added. After a particularly fierce blow he crawled to his feet, too dazed to rush. He staggered limply about, the blood flowing from nose and mouth and ears, his beautiful coat sprayed and flecked with bloody slaver. Then the man advanced and deliberately dealt him a frightful blow on the nose. All the pain he had endured was as nothing compared with the exquisite agony of this. With a roar that was almost lionlike in its ferocity, he again hurled himself at the man. But the man, shifting the club from right to left, coolly caught him by the under jaw, at the same time wrenching downward and backward. Buck described a complete circle in the air, and half of another, then crashed to the ground on his head and chest. He was beaten (he knew that); but he was not broken. He saw, once for all, that he stood no chance against a man with a club. He had learned the lesson, and in all his after life he never forgot it. That club was a revelation. It was his introduction to the reign of primitive law, and he met the introduction halfway. The facts of life took on a fiercer aspect; and while he faced that aspect uncowed, he faced it with all the latent cunning of his nature aroused. As the days went by, other dogs came, in crates and at the ends of ropes, some docilely, and some raging and roaring as he had come; and, one and all, he watched them pass under the dominion of the man in the red sweater. Again and again, as he looked at each brutal performance, the lesson was driven home to Buck: a man with a club was a law-giver, a master to be obeyed, though not necessarily conciliated. Of this last Buck was never guilty, though he did see beaten dogs that fawned upon the man, and wagged their tails, and licked his hand. Also he saw one dog, that would neither conciliate nor obey, finally killed in the struggle for mastery. Now and again men came, strangers, who talked excitedly, wheedling, and in all kinds of fashions to the man in the red sweater. And at such times that money passed between them the strangers took one or more of the dogs away with them. Buck wondered where they went, for they never came back; but the fear of the future was strong upon him, and he was glad each time when he was not selected. "Three hundred, and a present at that," was the prompt reply of the man in the red sweater. "And seein' it's government money, you ain't got no kick coming, eh, Perrault?" Perrault grinned. Considering that the price of dogs had been boomed skyward by the unwonted demand, it was not an unfair sum for so fine an animal. The Canadian Government would be no loser, nor would its despatches travel the slower. Perrault knew dogs, and when he looked at Buck he knew that he was one in a thousand -- "One in ten t'ousand," he commented mentally. Buck saw money pass between them, and was not surprised when Curly, a good-natured Newfoundland, and he were led away by the little weazened man. That was the last he saw of the man in the red sweater, and as Curly and he looked at receding Seattle from the deck of the Narwhal, it was the last he saw of the warm Southland. Curly and he were taken below by Perrault and turned over to a black-faced giant called François. Perrault was a French-Canadian, and swarthy; but François was a French-Canadian half-breed, and twice as swarthy. They were a new kind of men to Buck (of which he was destined to see many more), and while he developed no affection for them, he none the less grew honestly to respect them. He speedily learned that Perrault and François were fair men, calm and impartial in administering justice, and too wise in the way of dogs to be fooled by dogs. He was friendly, in a treacherous sort of way, smiling into one's face the while he meditated some underhand trick, as, for instance, when he stole from Buck's food at the first meal. As Buck sprang to punish him, the lash of François's whip sang through the air, reaching the culprit first; and nothing remained to Buck but to recover the bone. That was fair of François, he decided, and the half-breed began his rise in Buck's estimation. Day and night the ship throbbed to the tireless pulse of the propeller, and though one day was very like another, it was apparent to Buck that the weather was steadily growing colder. At last, one morning, the propeller was quiet, and the Narwhal was pervaded with an atmosphere of excitement. He felt it, as did the other dogs, and knew that a change was at hand. François leashed them and brought them on deck. At the first step upon the cold surface, Buck's feet sank into white mushy something very like mud. He sprang back with a snort. More of this white stuff was falling through the air. He shook himself, but more of it fell upon him. He sniffed it curiously, then licked some up on his tongue. It bit like fire, and the next instant was gone. This puzzled him. He tried it again, with the same result. The onlookers laughed uproariously, and he felt ashamed, he knew not why, for it was his first snow.